Petitfée Silk Amino Serum Mask – Put Your Make-Up On! Hey guys! It’s been so long since I’ve used a sheet mask let alone do a review on one and I actually think the last time I did a review on one was on our old blog! 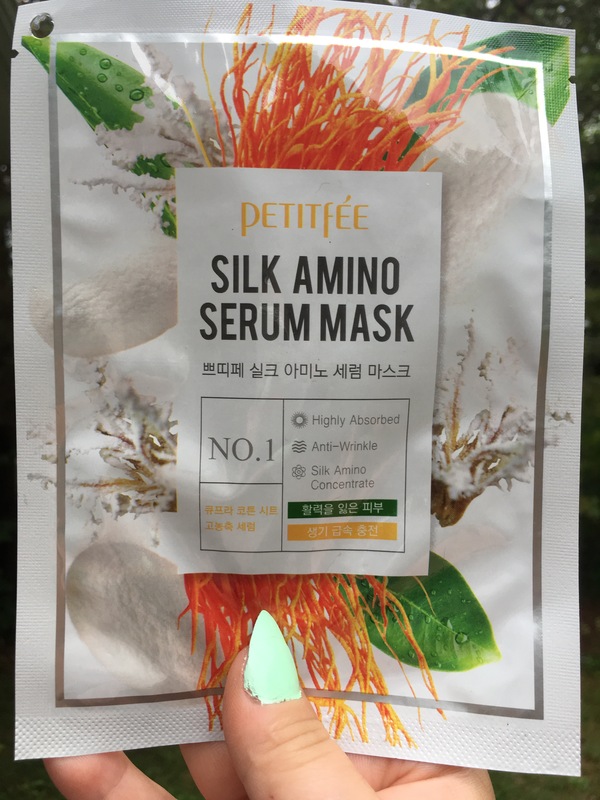 Today we’re going to take a look at a Korean brand that I’ve never tried before called Petitfée and their Silk Amino Serum Mask. I got this mask from a package from Raelene. So what is it is a sheet mask that is supposed to focus on keeping your skin shiny and ﻿bright. Cubra-Premium cotton sheet. Natural cellulose from the fluff of cotton seeds that feels silky smooth. Basically the sheet is supposed to feel really comfortable and wearable. Silk amino essence. Enriched amino acids from natural proteins in cocoons present glowing skin. Vegetable worms extract. The precious ingredient, vegetable worms extract supplies vitality into your skin and helps tighten skin. This is fairly typical for Asians to use animal by-products for their beauty regime. I’ve used some products with snail extract and they work wonders. It’s one of those things where you shouldn’t knock it until you try it. My initial thoughts from opening the pack was that it wasn’t scented, which is fine. Then when I went to take the mask out, it was so slimy I could barely get it out! This wasn’t even a good slime, like it was really bad. It was extremely excessive as well. I don’t even know. You could basically just call the essence slime, that is literally the texture of it. Then I tried unfolding the mask and even that was hard because there was so much slime on it. Okay, so I finally got it unfolded and put it on my face. Hopefully things will get better from here on out, yes? No. The slime will drip down off of the sheet mask and onto your chest AND from the eye patch area into your eye. Soo, at this rate I just don’t see myself searching for it online any time soon for a repurchase. Even after taking the sheet mask off, my face was still covered in slime and didn’t absorb a whole lot if at all. I also don’t see much of a result, again if at all. Initially I didn’t know what to expect from this mask or had any sort of expectations either so I wasn’t disappointed from my expectations I guess just as a whole. Have you tried this mask out? Have you had different results? Tell me what your thoughts are if you have!